Should we intervene in Syria ? With the massacre at Homs, Bashar al-Assad’s Baathist regime has given notice to the world that the slaughter in Syria will continue until it falls, which it must inevitably do in the not-too-distant future. The question is how many people will be killed before it does. The fall of this regime will be a tremendous step for peace and progress in the Middle East. Yet set against the strong humanitarian and geopolitical arguments in favour of intervention is awareness of the price that we will have to pay to do so. In Libya, the human loss involved in the overthrow of Gaddafi was greatly reduced thanks to Western military intervention; without it, the Gaddafi regime would probably still be slaughtering civilians today. The West has not been hypocritical in singling out Libya for military intervention. Libya differed from the start from other countries affected by the Arab spring, insofar as the rebels captured large areas of ground, which could then be defended by regular military means. It is something else entirely to protect civilians from the soldiers and police of a regime that still controls the ground in question. Even in Libya, we could not immediately protect civilians in Tripoli and other towns under Gaddafi’s military control from his security forces; these had to be driven out or destroyed first, and this was only possible because we began with rebel forces, in control of substantial liberated territories, that could be defended and built up. That is why the accusations that the West has been ‘hypocritical’ in intervening in Libya, but not in Bahrain, Yemen or Syria, have been unfounded. But the situation in Syria is rapidly approaching the stage when a Libyan-style intervention may be feasible. The overthrow of the Syrian regime is both a pressing humanitarian necessity and would bring enormous benefits to the Middle East. Baathist Syria has shown an exceptional readiness to massacre its own citizens, perhaps surpassed in the Arab world only by its defunct Baathist counterpart in Saddam Hussein’s Iraq. The current slaughter still has not reached the scale achieved by Bashar’s father Hafez al-Assad at Hama in 1982, when as many as 40,000 may have been massacred, but the Hama massacre should stand as a warning to what may yet occur if the outside world does not act. 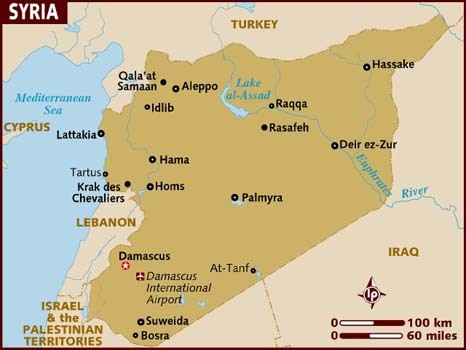 Furthermore, Baathist Syria plays an exceptionally egregious role in regional affairs: as the principal regional ally of Iran, supporter of Hezbollah and Hamas and most virulently anti-Israel of all Arab states, it contributes more than any other Arab regime to obstructing Middle Eastern peace. The overthrow of this regime would lower Arab-Israeli tension, weaken extremist forces in the region and further isolate the regime in Tehran. On the other hand, however overwhelming the case for humanitarian intervention in Syria is, the West will pay a stiff price in propaganda terms if and when it does. Unlike Gaddafi’s Libya, but like Saddam’s Iraq, the Syrian dictatorship is based upon the rule of a religious minority over a majority. As Saddam’s regime embodied Sunni Arab hegemony over Kurds and Shia Arabs, so Assad’s regime embodies Alawi hegemony over Sunnis. The overthrow of the Syrian regime will inevitably be bloody and is likely to assume the appearance, at some level, of an Alawi-Sunni inter-communal slaughter. Although Western military intervention, by speeding the transition, may result in less bloodshed than would otherwise be the case, it will inevitably mean that the West will be blamed for whatever such bloodshed – undoubtedly substantial – does occur. The massive slaughter that followed the fall of Saddam’s regime in Iraq, perpetrated above all by the Iraqi insurgency, was not caused by the US intervention – although the Bush Administration’s clumsy occupation policy undoubtedly exacerbated the problem. The fall of that regime would inevitably have had a bloody aftermath involving substantial violence between Sunni and Shia elements. But the US’s role in overthrowing it did mean that the US was blamed for the violence that occurred; violence that, more than anything else, discredited the intervention. This does not mean that the West and its allies should refrain from intervening. But it does mean that we should be extremely careful how we do so, studying the lessons of the propaganda disaster in Iraq as well as of the essentially successful interventions in Kosovo and Libya, and treating the propaganda front in any future intervention as of primary importance. We do not need a UN Security Council resolution to intervene, and it would be wrong to grant the Assad regime’s friends in Moscow and Beijing absolute power to block intervention. But we do need a broad coalition incorporating Arab states, Turkey and (informally) Israel, and enjoying at least the passive approval of a significant part of the international community as a whole. As a precursor, Britain and other Western states that have not done so should recognise the Syrian National Council as the legitimate representatives of the Syrian people, withdraw recognition from Assad’s regime and draw up plans to provide arms, training and intelligence to the Free Syrian Army. The coalition should prepare the ground for the eventual imposition of a no-fly zone over part or all of Syria, and for air strikes to defend cities liberated by the Free Syrian Army and other rebel forces, if and when this becomes strategically and diplomatically feasible. A no-fly zone could be followed by the establishment of a liberated area in northern Syria under Turkish-led Western military protection, where Syrian civilians would be safe and where rebel forces could operate freely and begin to build a new administration for the country. Two further conditions should be met before such full military intervention is launched. The first should be an unambiguous request for such intervention on the part of the Syrian National Council. The second should be confidence that any intervention would have to be reasonably safe for the forces intervening – Kosovo and Libya were successes in part due to the absence of Western casualties, which the Western public, after the experience of Afghanistan and Iraq, will not tolerate. Western leaders need to be very clear, however: though we can help the Syrian revolution to defeat the old order, we cannot guarantee that it has a happy outcome. It is the responsibility of the Syrian people and their revolutionary bodies – the Syrian National Council, Free Syrian Army and Syrian Revolution General Commission – to do this, and above all to prevent any sectarian bloodletting. But come what may, we should never accept the premise that those outside forces trying to halt the bloodbath are the villains: that title goes to the murderous regime in Damascus, and to its criminal defenders – in Tehran, Moscow and Beijing.